Like a lot of people of my broad political persuasion, I’ve been finding it very difficult to decide how to vote in tomorrow’s election for London’s mayor. Despite the importance of the post, the choice boils down to what one considers the least evil. I’m a Labour supporter, and would vote Labour without a second thought if we had a regular Labour candidate. However, I’d prefer London’s mayor to be a Tory rather than a genuine extremist of right or left; I’d vote Tory if it were the only way to keep out the BNP or Lindsey German and the Left List. Ken Livingstone is half-way between the Labour mainstream and left-wing extremism. He was resolute in supporting NATO over the liberation of Kosova and in condemning the 7/7 terrorist bombings in London (though his condemnation was shamefully marred by his description of the bombing victims as ‘working class’ – as if middle-class victims were less worthy). He has some real achievements as mayor to his credit, above all running an efficient bus service, something that I, who grew up in the 1980s and remember the horrors of the London bus service under the Tories at the time, greatly appreciate. Yet while I do not hate Livingstone, I do consider him unelectable in principle. His endorsement of various fascist and extremist political elements, from Yusuf al-Qaradawi to George Galloway, Kate Hudson and the so-called Stop the War Coalition, and his collaboration with unsavoury anti-Western leaders abroad such as Venezuela’s Hugo Chavez, make him unacceptable. How can we have a mayor for our capital city who has a working relationship with the enemies of our country and of Western civilisation ? Lest anyone think I’m simply being sectarian here: we’re talking about people who support the fascists in Iraq who are not only murdering innocent civilians, but killing our soldiers as well. What a disgrace. I’d rather have Boris Johnson as Prime Minister than Livingstone. Additional minuses for Livingstone are his philistine disregard for London’s heritage and opposition to Heathrow expansion – things that I, as a born and bred Londoner and a frequent flyer (though probably not as frequent a flyer as Ken himself) deeply resent. Having said all that, Livingstone has one great advantage over Johnson: he is a passing phenomenon. He will serve one more term and can then make way for a more palatable Labour candidate. By contrast, a win for Johnson could be the thin end of the wedge, leading to a Tory-controlled London for an unknowable length of time, and perhaps paving the way for a Tory victory at the next general election. So I’ll cast my protest vote for Brian Paddick, with a transfer to Livingstone. I should add that I dislike the Liberal Democrats as an essentially irrelevant party and the ignominious recipient of the anti-Blair Guardianista protest vote at the last general election. But Paddick seems a decent enough chap. I’m sorry if none of this sounds very idealistic, but such is the choice that we in London face tomorrow. Hopefully, we’ll be given a better choice next time around. 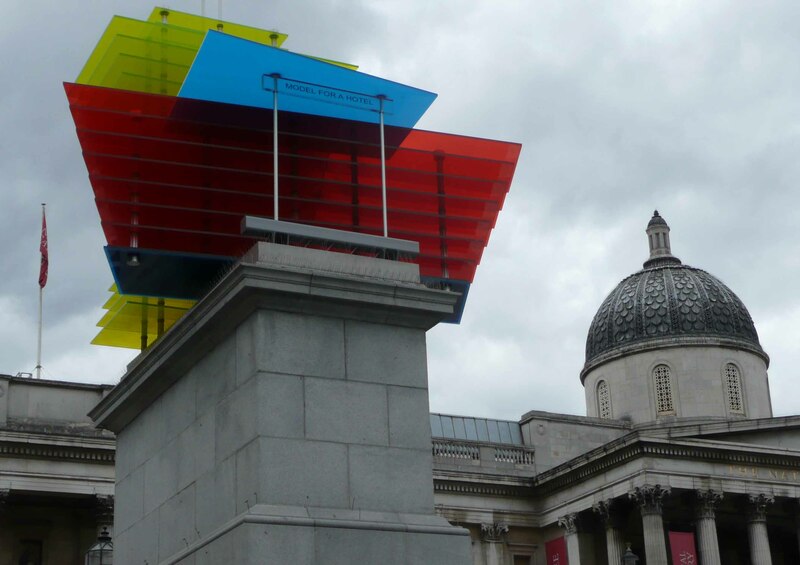 Walking through Trafalgar Square recently, I was pleased to note that the incongruous statue of a naked pregnant woman with no arms had been removed from the ‘fourth plinth’, but disappointed to see that it had been replaced by something still more out of harmony with the aesthetics of the square: a multi-coloured glass sculpture (pictured above). For those who do not know, Trafalgar Square, in the very heart of London, has a plinth in each of its four corners, three of which have long been occupied by statues of King George IV and two nineteenth-century British generals, Sir Charles James Napier and Sir Henry Havelock, while the fourth was empty until 1999. Since that year, the fourth plinth has been occupied by a succession of sculptures by contemporary artists. Lacking the vision and the courage to choose a suitably worthy figure for a statue on the fourth plinth, the London authorities have simply turned it into the site for displaying pretentious artwork that rightfully belongs in the Tate Modern or on the South Bank, and that destroys the visual balance of our capital’s central square. The best that can be said for this arrangement is that it prevents the fourth plinth from being permanently blighted by whatever monstrosity the Powers that Be would probably select for it. London Mayor Ken Livingstone is on record as having suggested the removal of the statues of Napier and Havelock as well, on the grounds that ‘I think that the people on the plinths in the main square in our capital city should be identifiable to the generality of the population. I have not a clue who two of the generals there are or what they did.’ Such a mentality really is beyond parody – one could joke that Livingstone would probably like to tear down Lord Nelson (‘Nelson who ?’) and replace him with the statue of an EastEnders star, a Big Brother contestant or a large-breasted ‘celebrity’ like Jordan or Abi Titmuss, but it would not quite do justice to the sort of wilfully destructive philistinism that his statement reflects, reminiscent of Chairman Mao’s assault on China’s architectural heritage in the Cultural Revolution. Livingstone has, indeed, emulated Mao’s genocide of China’s sparrows with his own campaign to rid Trafalgar Square of the pigeons for which it was famous. Another of his innovations has been the scrapping of the traditional ‘Routemaster’ double-decker bus and the introduction of the widely despised ‘bendy buses’. The excuse that the Routemaster was unsafe for passengers and unsuitable for disabled people was never very convincing – Livingstone’s rival mayoral candidate Boris Johnson is apparently backing the introduction of a safer and disabled-friendly version of the Routemaster, an idea that appears obvious. But it is not just politicians of the Left who have shown themselves ready to destroy London’s heritage: the Conservative era saw the replacement of most of our red telephone-boxes with a hotchpotch of different but equally characterless phone-booths that, as I understand, are the consequence of the privatisation and breaking up of our telephone network. The problem is not modernity or newness. London’s two most iconic landmarks are probably Big Ben and Tower Bridge, which are both relatively recent additions to the capital, dating only from the second half of the nineteenth century – the same period that gave us the statues of Havelock and Napier in Trafalgar Square and, indeed, Paris’s Eiffel Tower. A thoroughly modern yet beautiful building like the City of London’s ‘Gherkin’ can rapidly and rightfully become a treasured landmark. The problem is small-mindedness and philistinism. The most depressing aspect of the whole Millennium Dome fiasco was that such a unique and spectacular building should have been built with only a limited lifespan – the Victorians built great buildings that continue to define London today, while our contemporary politicians do not seem to think in such grand terms. Trafalgar Square’s fourth plinth needs a statue that will merge both visually and thematically with the existing statues and with the square as a whole. Given the patriotic and military theme of the square, and the fact that two eminent generals occupy two of the other plinths, I would suggest a distinguished British military commander of our own age. One possibility might be Major General Sir John Jeremy Moore, who died last year at the age of 79 and was described by the Guardian’s obituary as having been ‘the most famous military commander in Britain’ and by the Daily Telegraph’s as ‘a household name in Britain, most of the English-speaking world, and in Argentina’. The choice of Moore might therefore satisfy even Mayor Livingstone. Moore commanded the British land forces in the Falklands War and received the Argentine surrender. This was, of course, a decisive factor in the overthrow of the military dictatorship in Argentina and the restoration of democracy. The Falklands victory is often viewed by liberals and leftists, in their all-too-typically self-centred manner, simply in terms of its supposed role in keeping Margaret Thatcher in power (‘Stuff the Falkland Islanders – all that matters is that Maggie loses’). Even though the Labour leadership itself supported the military campaign to liberate the islands. Even though it is a myth that Thatcher won her second election victory because of the ‘Falklands Factor’ – the Conservative vote actually declined in the post-Falklands 1983 general election in relation to the previous general election in 1979. The Conservative victory in 1983 had much more to do with other factors, above all the weakness and unpopularity of Labour and the split in its ranks that gave birth to the Social Democratic Party. It is a disgrace that even a genuinely defensive war against a fascist aggressor, waged cleanly and with minimal civilian casualties, should be condemned purely on sectarian domestic political grounds. Erecting a statue of Major General Moore on the fourth plinth, quite apart from honouring a distinguished British soldier and visually rescuing Trafalgar Square from its current aesthetic martyrdom, might help to give the Falklands campaign the profile it deserves. 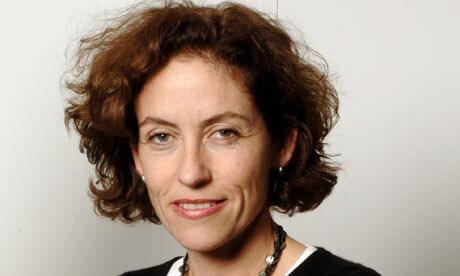 Madeleine Bunting is legendary as the human incarnation of liberal English middle-class guilt. Well, it appears that this time she really has something to feel guilty about. In her most recent piece of hand-wringing, she takes herself to task for her failure to be sufficiently environmentally friendly: ‘Is it enough to have halved family meat consumption, have foregone flights for several sun-starved years and arranged a life in which habits of cycling to work and walking to school are routine ? No, it’s just scratching at the surface.’ Maddy of the Sorrows has for some time now been suggesting the foregoing of foreign holidays, or at least driving instead of flying abroad, as a way of reducing carbon emissions. But what does her suggestion really mean ? As an environmentalist, Mastny argues that the point is not to end tourism, but to make it more environmentally sustainable: ‘The most sustainable option of all would be to stay at home. But in a world where travel is an increasingly important vehicle of cultural exchange, as well as a crucial driver of the world economy, this is an impractical and unrealistic solution.’ Mastny does not appear to have taken account of Bunting’s personal crusade to deprive the world’s poorest countries of their second-largest source of foreign exchange. Bunting’s suggestion that people only travel when completely necessary, and take the car or train rather than the plane, would realistically mean that almost nobody in Britain would go on holiday much beyond France – who is going to travel overland to Tanzania or Cambodia ? There was a time when progressively minded people were in favour of a cheap and efficient transport system and affordable foreign holidays for working-class people. This is apparently no longer the case. London’s left-wing mayor, Ken Livingstone, has apparently ‘made it clear that I oppose all airport expansion in London and the South East, not just at Heathrow’. This from a mayor who spends much of his time travelling to exciting places all over the world. There is a campaign to halt the building of a third runway and sixth terminal at Heathrow Airport. If it succeeds, it will prolongue the suffering of millions of people, resulting from the fact that Europe’s busiest airport is also just about Europe’s most overcrowded; in fact, flying from Heathrow in summer is an absolute nightmare. 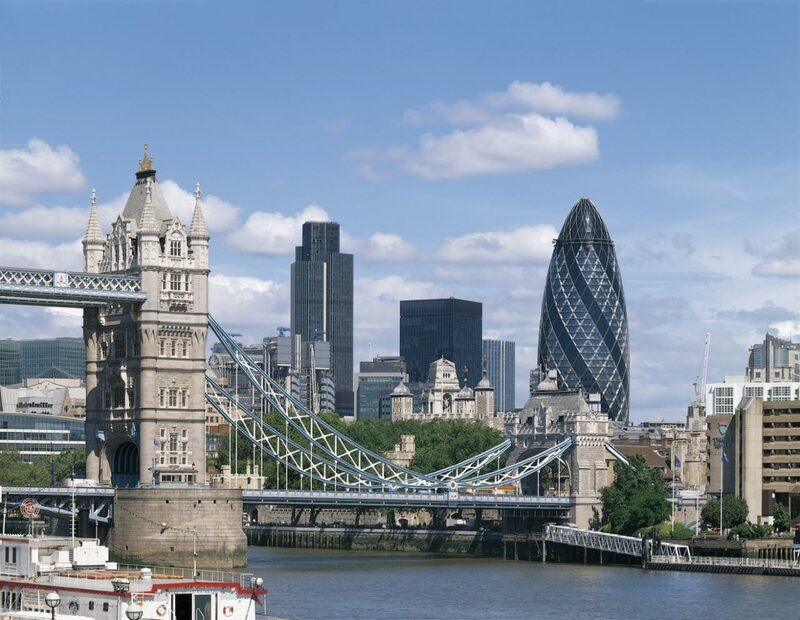 If the campaign succeeds, London’s position as the world’s leading financial centre will suffer. But this will not prevent increasing millions of British people from flying away on holiday each year, or millions of foreigners from flying to Britain. It will just make it more difficult and unpleasant for them. There are other, more effective ways of helping the environment than avoiding flying abroad on holiday. One can, for example, avoid having children. Or one can simply kill oneself – probably the most environmentally friendly option of all. Anyone who opts to take any such step is free to bask in the warm glow of self-righteousness and enjoy the sensation of moral superiority vis-a-vis lesser beings. But real angels are polite enough to keep these feelings to themselves.